Twelve weeks of lecture are over, and we’re all buzzing with excitement as we pack and clean in preparation to go on outreach. 33 students and 7 staff are flying into Ethiopia to follow Jesus’s commission, to go into all the nations and preach the gospel. The incredible ways God has been working in all of our hearts and providing by miraculous means have given us so much faith, hope, and peace for these upcoming three months in Africa, and we believe that God will work mightily through us. The first half of our Discipleship Training School has been teaching us all about how to be an artist in God and use our gifts for ministry. Each of us in the Fine Art, Dancing, Writing, Music, and Photography tracks (and the pseudo-track Theatre) has been working hard on practicing and growing, even putting on an exhibition in YWAM Nürnberg’s Wonderland Cafe. Part of developing a sense for God’s heart is reaching people here in Nьrnberg, so many students have formed strong friendships with local families and refugees. We also visited Berlin for a week of mini-outreach, going out into the city to follow the Holy Spirit’s promptings and doing such things as starting a photo series about freedom, performing a skit in front of the Brandenburg Gate, and surprising commuters with a flash mob in the train. That time was excellent practice for the next half of DTS. We’ll all be in Ethiopia for the first two weeks, then split off into teams to reach other communities: one team to a different part of Ethiopia, one to Djibouti, and one to Kenya. After a month apart, we’ll regroup to encourage each other and share what God has done, then seek His guidance on where He’d like to use us next. Financing this trip has been costly for many of us, but God is nothing if not faithful. So many people, both students and staff, have been unable to provide for themselves, which has created an opportunity for fees and supplies to be given to them, either from supporters at home, fellow YWAMers, or by a miracle. We all have been financed for this leg of our journey, and we believe God will continue to provide for us to overcome any obstacle, monetary or otherwise. This time in Africa will be exhilarating, stretching, and slightly terrifying. As we prepare to leave in only a couple days, we’d ask you to keep interceding for us, as well as the countries we go to serve. Provision, protection, and guidance from God are all things we need, and your prayers will be appreciated. Thanks for keeping us in your thoughts and all the support you’ve given us! 12 Wochen Unterrichtsphase sind um und wir sind voller Freude und Aufregung wдhrend wir unsere Sachen packen und mit dem Aufräumen, was wohl oder übel vor dem Outreach passieren muss, beginnen. 33 Studenten und 7 Mitarbeiter werden nach Äthiopien fliegen, um Jesu’ Ruf, in alle Nationen zu gehen, um das Evangelium zu predigen, zu folgen. Gott hat durch unglaubliche Wege unsere Herzen verдndert und uns auf übernatürliche Art & Weise mit so viel Glaube, Hoffnung und Frieden für die nächsten 3 Monate in Afrika vorbereitet. Und wir glauben, dass Gott durch uns GroЯes tun kann und wird. In der ersten Hälfte der Jüngerschaftsschule ging es vor allem darum, wie man ein Kьnstler mit Gott ist und wie wir unsere kьnstlerischen Begabungen & Talente für Seinen Dienst nutzen können. Jeder von uns, sei es aus dem Bereich Malen, Tanzen, Musik, Schreiben oder Fotografie (oder dem sich spontan gegründeten Theaterkurs) hat hart gearbeitet, geübt, ist gewachsen und hat sogar teilgenommen an der Ausstellung unseres JMEM Nürnberg Wonderland Cafès. Ein Teil davon Gottes Herz besser kennen zu lernen, ist die Menschen hier in Nürnberg zu erreichen und einige Studenten haben starke Freundschaft zu Familien und Flьchtlingen in der Nachbarschaft gebildet. Anfang Oktober waren wir alle zusammen für eine Woche in Berlin bei einem “Mini-Einsatz”. 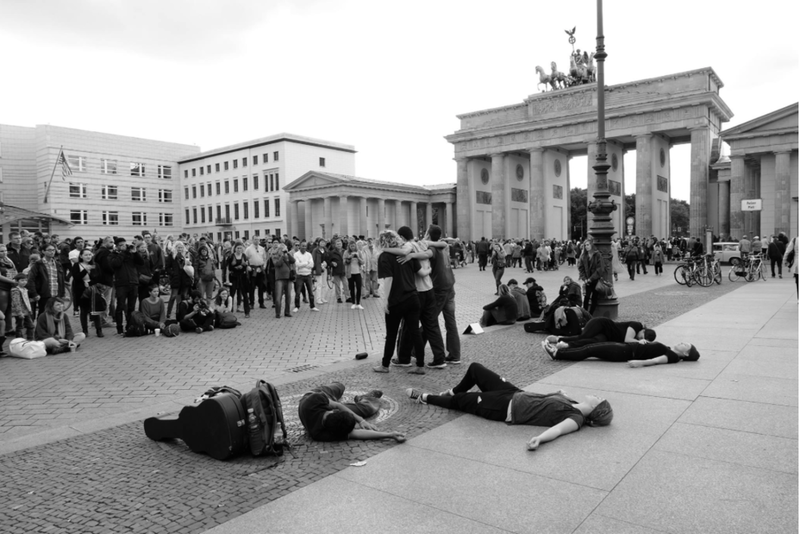 Geführt vom Heiligen Geist entstanden dadurch Projekte wie: Eine Fotoreihe über das Thema “Freiheit”; ein Tanzstück, welches vor dem Brandenburger Tor performt wurde und ein Flashmob, bei dem die Einwohner der Stadt in der U-Bahn oder im Zentrum durch Musik überrascht wurden. Diese Zeit war eine wunderbare Vorbereitung auf die 2. Hälfte der DTS.